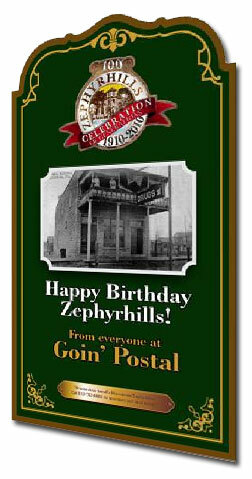 Centennial Street Signs - Zephyrhills, Florida 100th Anniversary! Join the residents and businesses of Zephyrhills in celebrating the 100 Year Celebration taking place all this year. We will be erecting giant 7′ tall signs all the way along Main Street, each featuring a vintage photograph of the sponsors choice depicting the history of Zephyrhills (photos supplied by Madonna Jarvis Wise). Choose from 700 photographs and personalize your card with your own message to the community of Zephyrhills. Order now.